Bangladesh 282 and 3-269 (Mominul Haque 126*, Tamim Iqbal 70, Neil Wagner 2-52) leads New Zealand 437 (Corey Anderson 116, BJ Watling 70, Kane Williamson 62, Shakib Al Hasan 5-103) by 114 runs. The first innings of the Bengal Tigers was squeezed for 282 and they thrashed 269 in 89 overs for the loss of three wickets in the second whereas the Black Caps hammered 437 in their first innings. The fourth day’s play came to an end on Thursday, October 24, 2013, at Shere Bangla National Stadium, Mirpur. Earlier, the Kiwis started the day at 8-419 in 133 overs, BJ Watling along with Ish Sodhi were batting on 59 and 55 runs. The latter was run out for 58 and Watling cemented his end for 70 as the visitors amassed 437 after 140 overs. Shakib Al Hasan was the main wicket taker with five, Abdur Razzak held two whereas Al-Amin Hossain and Nasir Hossain claimed one wicket each. Bangladesh initiated their second innings with a deficit of 155 runs as Tamim Iqbal and Anamul Haque scored 39 runs for the opening wicket. The latter was gone for 22 and Marshall Ayub lost his wicket cheaply at nine. Mominul Haque joined in with Tamim Iqbal and they commenced their journey towards stability. The duo did not take any risk and Tamim Iqbal achieved his second fifty of the match with a four while Mominul Haque got his half century in the 46th over. The latter was the most attacking of the two and powered his second Test century with another boundary. 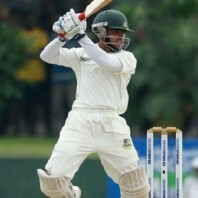 Tamim Iqbal became the third victim at 212 for 70 and was replaced by Shakib Al Hasan who maintained the flow of runs. Mominul Haque remained unbeaten for 126 off 225 balls with 16 fours, Shakib was at the other end at 32 as the hosts smashed 3-269 runs. Neil Wagner got two wickets and Kane Williamson chipped in with one. Bangladesh has taken an overall lead of 114 runs with seven wickets still remaining and the match is heading towards a possible draw.